As I sit, surfed out and arms aching, basking in the sun on the sugar scoop and feeling the cold easing from my body, I gaze out past s/v Akimbo at another perfect set of glassy waves peeling down the reef and say to Lyn (basking in the sun on the other side of the scoop): “It doesn’t get any better than this!”. This is the third day in a row I have said that, and it keeps getting better! As a keen surfer and sailor I am sure I share the dream vision of many to anchor one’s yacht in a nice settled anchorage position with perfect waves nearby. Ouano surf break on New Caledonia’s west coast is one of the places where this dream can come true. At time of writing we have already had ten days of excellent surf pretty much all to ourselves (Pete, myself and a couple others). The wave reminds me of Cloud Break in Fiji, but is less intimidating with a friendlier end section, which all in all gives it a pretty mellow and safe feeling. On the larger waves you often make all three sections and there is usually a barrel on offer if you are brave enough and good enough. You can anchor the boats a bit further into the pass and wide of the waves and it is a remarkably quiet anchorage given the setting. 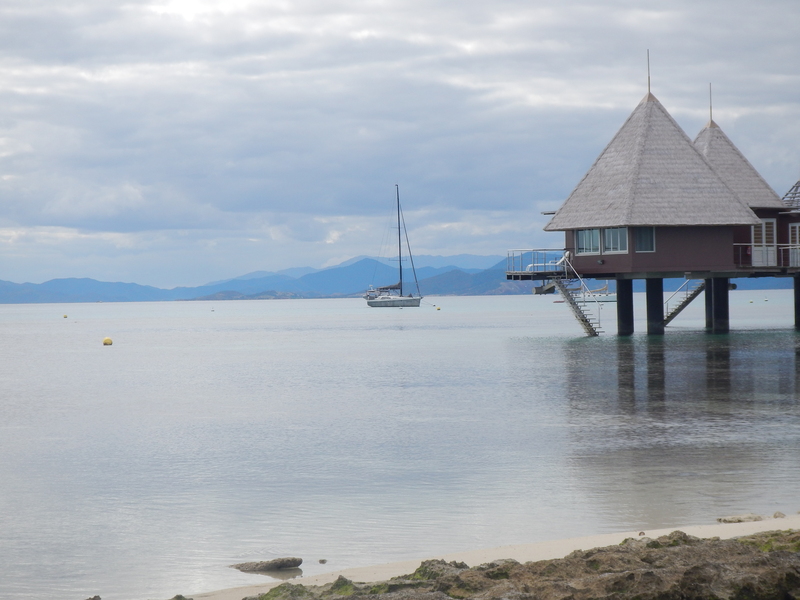 We left Port Moselle marina at about midday, Thursday 13th August, and began our island-hop Northward up the lagoon. That afternoon we sailed around Orphelinat and Citrons bays getting a feel for the coastline near Noumea, then out to Maitre Island where we took a mooring and went ashore on the paddle boards. It’s a pretty island with a nice looking resort and has an excellent kite-surfing location on the South Eastern side where the Noumea based kite surf schools take their students. It’s a perfect beginner kiter setup with a large shallow sand and sea grass area, on-shore in the prevailing trade winds. The wind was light when we were there but flags on the beach advertise the various schools and manufacturers. We returned to the boat and headed a short distance north to Nge Island. We took a mooring and went ashore to explore this pretty little sand island (no resort on this one). This island is fairly typical of many of the islands in the huge lagoon fringing New Caledonia. It is low-lying and surrounded by a pretty white sand beach. Off the shore is fringing coral reef or coral patches and heads mixed with a bottom of coral slate or sand, in places sand and sea grass. The islands vary in their nature protection, a few do not allow landing at all, most allow landing and have nature reserve restrictions, many allow camping and have some rudimentary facilities including toilets. One of the great things about New Cal is that it is a lot more easy-going with respect to legislation than Australia (the nanny state). People camp wherever they like on the islands, wear no helmets on bicycles etc. There are rules and they are obeyed, but there are not a million signs telling you what not to do. We spent the night at Nge including an absolutely stunning sunset (the first of many). Next morning we set off on a meandering sail northwards, investigating Dumbea pass and various islands in the lagoon. The Western lagoon is formed by a fringing reef which is only about 3 to 4 nautical miles off the main island. This makes for very sheltered flat water sailing conditions which are an absolute pleasure. In flat water a yacht will slip along quietly and easily, even with little sail up and light winds, so sailing up and down the long length of the lagoon is really nice and easy. There is also a vast choice of good sheltered anchorages, so there is no pressure to get to a particular spot on time before sunset. In fact, much of the lagoon is 12 meters or less deep, so you could in fact anchor just about anywhere in need. That afternoon we settled down in a beautiful bay west of Ndukue island, a spot recommended by Pete from Akimbo. It is a small bay inside a rock point with small limestone overhanging cliffs and sheltered by hills. We were all alone there in a stunning setting. We took the stand-up boards ashore, finding a deep enough pathway through the pretty lilly-pad-like fringing coral (Lyn spotted a Lion fish) and walked up the hill for a lovely view of the surrounding area then enjoyed the sunset from the beach. Next morning on the high tide we paddled around the island investigating the overhangs and caves, coral, beaches and shallow waterway between Ndukue and the main island. Then it was off to St. Vincent’s pass and Tenia Island. We sailed past the left-hand surf break of St. Vincent’s pass, it was quite windy South Easterly trade wind with a big swell and quite wild conditions, but the 3 surfers in the water were getting some good rides. Bruce was itching to get in the water but the conditions were a bit sketchy for anchorage and leaving Lyn on the boat so we headed in to Tenia island. Tenia is one of the most beautiful islands here. 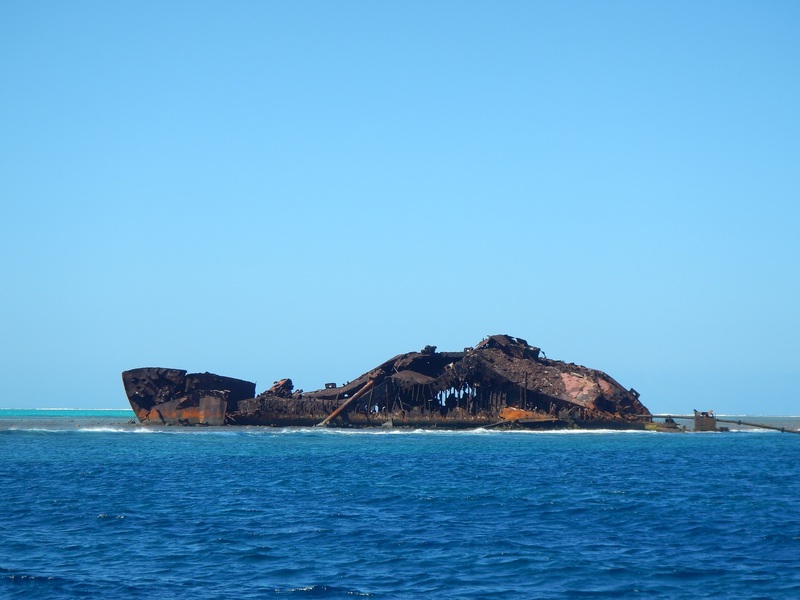 It is quite a large low island in a heart shape integrated with the main barrier reef, including a hooked section of the reef that creates one of the few outer reef dive spots sheltered from the waves. On the Northern side of the island is a large sand-spit finger and yachts can anchor on the sand bottom between the spit and the reef. Shoal draft vessels such as Jolifou can get in really quite close to the island beach which is a really lovely setting. One could remain there overnight, but it can get a bit uncomfortable and rolly on the high tide and potentially dangerous if the anchor dragged, so one tends to just day-anchor there. We spent three days at Tenia island during the day then doing a short sail to a great anchorage at Puen island for the night. Bruce took the dinghy out to St. Vincents left for his first surf. A bit of an intimidating experience as it was a long trip in the dinghy with quite strong wind and big waves, and ended up being the only surfer out there. It was nice to get the surfing mojo going tho. Akimbo arrived on the second day and Pete and Bruce had a good surf together in nicer conditions the next morning. On day 3 we went for our first scuba dive, taking the dinghy out over the reef at high tide and diving on some interesting deep bommies on the outside. This is not the main recommended dive spot at Tenia but we wanted to start somewhere tame because it had been a long time since our last dive. We saw a huge ray, a sea snake and some large fish in a nice swim-through gulley. We also did some exploring on Puen island including an absolutely magical sunset walk with a spectacular sky reflecting off the glass-like water over the shallow fringing reef. Next morning it was time to head North to the allure of Ouano surf break, which Pete had assured Bruce was even better than St. Vincents. We had a look at the “Titanic” surf break on Isie pass on the way, which looked really nice (a hollow right-hander) but the locals are very protective of this break and foreigners are not welcome. We had our first surf at Ouano in fairly windy conditions but the waves were still excellent, this is my new favourite surf spot! We spent the night anchored in Ouano bay about 4 miles from the surf break and headed out the next morning for another excellent surf. Just Pete, Bruce and one other French local surfer in 4 to 6 foot perfect waves. Next day it was Bruce’s birthday (21 August) and mother nature gifted him even better surf, 4 to 6 foot, glassy conditions and just Pete and Bruce out there. We went out on Akimbo leaving Lyn on Jolifou as she wanted to prepare the birthday dinner. She was thrilled to have Perret ask her if she wanted to have a lift to La Foa for some much-needed provisions. In the afternoon Bruce had his first kite-surf in the anchorage area and we ended the day with a beautiful birthday dinner with Pete, Ness and new friends Patrice and Perret from s/v Bonte. Patrice and Perret are pretty much permanent residents of Ouano bay on their majestic schooner and Pete and Ness had befriended them on previous trips. Bonte is a really striking and unusual boat built by Patrice over 40 years ago: pirate-ship like with huge aft state-room and elegant figure-head, and this may be the only yacht in the world with a microlight airplane aboard! As you would expect, Patrice and Perret are unusual and extremely interesting people. With a bit of a hangover, smaller surf, and expecting weekend crowds we took a break from the surfing on Saturday 22nd and had a relaxing day exploring a little island near the reef and a late afternoon walk up the hill overlooking the Oauno anchorage. By Sunday the surf was firing again, glassy 6 foot perfection and the Aussie yachties (Pete, Bruce and Slade from Eos 2) had an epic early morning session to themselves before a few locals arrived on their boats. The locals generally have trailer-able tinnies or speed boats that they drive up from Noumea, launch at the boat ramp in Ouano bay and bring out to the surf break at the pass. Fortunately for us, they don’t get out very early. They usually spend the whole day out there and there is a bit of a carnival atmosphere. Everyone was very friendly and there was never much more than 15 surfing at a time, so still plenty of waves for the yachties in our afternoon session. We are however very respectful of the locals and mindful that they only have the weekend whereas during the week we can have it to ourselves, so we keep a low and mellow profile out there. The effects of the prevailing wind. On Monday the waves were a touch smaller but we still had an excellent morning session again. By midday the South easterly wind had picked up a bit and we launched Bruce’s 12 square meter kite off the back of the boat for the first time ever. This is something Bruce has wanted to do for some time, but can be quite tricky to do. He pumped the kite up half in the water on the sugar scoop, connected the lines and let the kite float downwind letting out the lines slowly. The kite tried to mess itself up a couple times on the way out but eventually launched nicely and Bruce had a fantastic time kiting/surfing the waves. This is a perfect setup for surfing waves with the kite as the South Easterly trade wind is a perfect cross-offshore angle on the waves, especially for a goofy footer like Bruce. That night we had apertifs and drinks on Bonte and got to do the tour of this amazing boat. It is pretty huge compared to our boat and just so solid. Patrice has made a lot of very clever things on the boat over the years, including a gimballing bed and of course the aft platform for the microlight. They can launch and attach the wings of the microlight from the boat (it is effectively a sea-plane with a floating hull). Perret also has an amazing on-board garden, made using boxes and pots. The surf had gone down by Tuesday and Lyn paddled the standup board over to a pretty lagoon island (Konduyo) while Bruce went in the dinghy with the other board. We paddled around this perfect little island exploring the reef and then enjoyed skinny-dipping on our own private island for the rest of the day. Next day we took Joilifou out to have a look at Isie pass and the big ship-wreck out there, then, for a change of scenery we went in behind Lebris island to a pretty little bay anchorage where we had lunch. At the same time Lyn was doing some laundry on the boat and after some initial hiccups she managed to get the washing machine working. Later in the afternoon the South Easterly was getting quite strong and we moved further into Ouarai bay to an anchorage advertised by the cruising guide as “the place to go when you need a good rest from developed trade winds”. It was indeed really well sheltered and we were lucky enough to see two small sharks (fins) as we watched the sun going down. Next morning we motored back to Ouano anchorage as we wanted to join Perret, Pete and Ness for a trip into La Foa. Apart from provisions we were able to sign up for a Mobilis “Liberte” pay as you go sim card which has enabled us to have a working phone here as well as being able to activate internet access in one hour (unlimited data) chunks. This is now enabling us to post these blogs for the first time in a while. The next few days were a bit like groundhog day, but with a perfect surf theme. Early morning 5:30 am Bruce would awake and start getting the boat ready for leaving for the reef. By 6:00 am there would be a flotilla of four aussie yachts motoring out to the reef (Jolifou, Akimbo, Eos 2, Rhino). Lyn might rise at this stage and have a coffee and enjoy the sunrise during the trip. By about 7 the yachts were anchored off the break and the surfers headed out to the lineup (each boat only had one surfer each). Whilst the boys were surfing the girls would do any number of activities including: paddling to the nearby little island on standup or kayak, snorkeling, swimming, sunbaking, taking photographs. Somewhere around 10 or 11 the surfers would return to the boats one by one, for a coffee and croissant or toast and to warm up a bit. On one occasion Lyn paddled out on the standup with croissants and water for Bruce, now that is what I call great service! There might be a second surf session before or after lunch and at some stage around mid-afternoon the boats would sail back to the anchorage (jib only) in the South Easterly wind that had built up. There might be a late afternoon walk near the anchorage and then possibly sun-downers on one of the boats. Surf trips don’t come any better than this, I am sure. By jolifou in Uncategorized on September 9, 2015 . Thanks Mom. Dont worry, Pittwater is nice too, and yes we will be planning our next trip. Hi Bruce/Lyn – awesome post the surf sounds amazing and that break is now definitely on the bucket list. down the track – keep those pics coming. Thanks for that, hope you’re having a good trip. Definitely should be on the list, you will love it.